Strewn on the floor are four swords, one axe, one shield, one mace, one antler-topped helmet, and a half-eaten apple—the carnage of war. Is this any way to decide a nation's destiny, what Hotspur himself calls "the chance of war"? Prince Hal (Tony Latham) is thrown into the throne by his father, King Henry IV (Eric Schoen) in the Southwest Shakespeare Company's production of William Shakespeare's Henry IV, Part One. 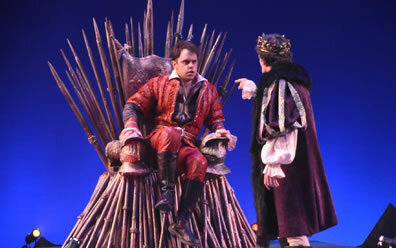 Scenic Designer Tiana Torrilhon designed the throne, emulating that of Game of Thrones but using spears instead of swords, and deliberately sized to fit only Henry. Photo by Laura Durant, Southwest Shakespeare Company. When Henry Bolingbroke returned from exile to reclaim his rights to the Duchy of Lancaster in England (recounted in William Shakespeare's play Richard II), he went further and ended up deposing Richard, becoming King Henry IV, and getting his own Shakespeare play (two of them, in fact). As Duke of Lancaster, Henry would have been one of the wealthiest men in all of Europe; instead, he became king of a bankrupt country. "It's perceived power," says Susan Willis, dramaturg for the Alabama Shakespeare Festival. She is here in Mesa, Arizona, to lead a seminar in conjunction with Southwest Shakespeare Company's production of Shakespeare's Henry IV, Part One. "And a nice piece of head jewelry comes with it. It's all about the bling." That bling and a throne recognizable to Game of Thrones fans are centerpiece props in SW Shakespeare's production. The throne, by Scenic Designer Tiana Torrilhon, comprises spears (rather than swords) with a shield-and-swords crest on the seat back and medieval helmets on the armrests. It sits at the back of a multilevel raked platform and rotates to serve as an innocuous bundle of sticks at the back of the Eastcheap tavern scenes. Ragged banners hang from the ceiling, the lighting giving them different qualities depending on the scene's setting: court, tavern, battlefield. Director Asia Osborne opens the play with abbreviated scenes from Richard II of Henry (Eric Schoen) receiving the crown from Richard (Seth Scott). "Part of your cares you give me with your crown," Henry says. Schoen is a man of vigor and virility in these brief moments, but as he places the crown on his head, his shoulders bow into a perpetual slump and his knees buckle ever so slightly. In this posture he speaks the opening lines of his eponymous play with entrenched weariness: "So shaken as we are, so wan with care…"
Henry's not having much fun being king, it seems; far more fun is vying for the crown, awaiting the crown, or manipulating crowns as, respectively, Harry "Hotspur" Percy, Prince Hal, and Falstaff are doing. Osborne gives equal weight to all four characters in a production that sets out to balance the play's comic and dramatic elements. The court scenes are steadily serious and static while the tavern scenes and Gads Hill robbery feature double doses of slapstick centered on Falstaff's cronies. James Cougar Canfield is a stiffly formal Blunt and a silly, insecure Bardolph who, with each insult, runs crying to the bosom of Mistress Quickly (Megan Lindsay, who also plays Worcester). Alexis Baigue is an inept Gadshill and a 93-octane-testosterone-fueled Douglas. Scott, in addition to his brief play-opening appearance as Richard resembling Jesus on trial, plays a mellow Mortimer and an electric-bass-playing, easily frightened Peto (personal shout-out to Scott's Peto playing the opening riff of Jethro Tull's "Aqualung" on his bass, kicking a pillow off a chair to place his foot on the seat a la Ian Anderson's one-legged flute playing). The play's two tonal strands merge in the final scenes when Falstaff (Keath Hall) and cronies become part of Henry's and Hal's armies in the battle against the rebels. Falstaff tellingly enters through the audience (aka, his army) fast-marching to a jody trailed by Bardolph mangling the jody verses: both end up on stage shuffling to "Boom, chucka-lucka-lucka, Boom, chucka-lucka-lucka." Comedy and tragedy literally crash into each other at the play's climactic moment when Hotspur has Hal down in their fight and Falstaff runs on to distract Hotspur, accompanying his lines "Well said, Hal! To it Hal!" with lewd dancing, giving Hal time to pull out a hidden dagger and stab Hotspur. A few moments later, Falstaff struggles to carry off the body of Hotspur, whom he will claim to have killed himself. The quick and the dead appear to be in a sexual tumble and roll when Hal re-enters with the Duke of Lancaster (regendered as Princess Joan, played by Bonnie Beus Romney). Though he's playing a dead Hotspur, Joshua Murphy gives one of the most generous peformances in this scene I've witnessed. 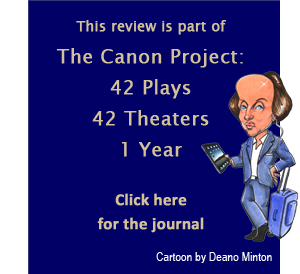 In other scenes, where Shakespeare himself straddles genres, textual cuts leave us wanting. Hotspur's reading the letter from the "dish of skim milk" in Act II, Scene 3, is totally excised, though the scene's tête-à- tête with Lady Hotspur (Hilary Kelman) remains—and played with intense bipolar sexuality. In the rebels' war council in Wales, with its manhood-measuring face-off between Hotspur and Glendower (Canfield), what should be serious business Shakespeare presents as one of his funniest scenes in the canon. This production lines it up as Canfield, wearing robes and hat covered in greenery and pine needles, plays Glendower with over-the-top grandiosity, describing his ordained singularity and magical capabilities, opposite Murphy's impatient, no-nonsense Hotspur. We have the makings for a hilarious rave-up, but their contention leaves off as soon as it begins. Upon Glendower claiming he "can call spirits from the vasty deep" and Hotspur replying "so can I, or so can any man, but will they come when you do call for them?" the two laugh and start talking business. Gone are their silly arguments over how to shame the devil, over Glendower's military prowess and English-speaking abilities, and over changing the course of the River Trent—some 70 lines of lost potential from these two actors. This scene does yet deliver some richly theatrical moments, both grand and subtle. As the wives are brought on stage, Glendower's daughter, Lady Mortimer (Romney speaking, reportedly, accurate Welsh), shoves aside Lady Percy to get to her husband, Mortimer; Lady Percy subsequently tells Hotspur, who keeps interrupting Lady Mortimer's singing, "Wouldst thou have thy head broken?" which obviously is a valid warning. Meanwhile, Glendower's announcing that his daughter will sing sends Lindsay's Worcester in earnest search of a drink. Lady Mortimer never gets to start her song, however: Hotspur constantly cuts her off, and when he leaves in a huff, the other warriors follow, leaving the two wives alone on stage. Romney's Lady Mortimer begins singing, in English, "Stand in That River": "I went to the river / But the river was dry / The dust strolled up / Into my eyes / I was blinded by / A sorrow so deep / That I might lose my soul to keep." Romney is joined in song first by Kelman and then, one by one, the rest of the cast forming a line near the front of the stage. Falstaff walks on, passes through the line, and strolls off. When Henry enters, the line parts to allow him through. Then, sauntering in from the other side and slipping through the chorus is Tony Latham's Prince Hal, who stands opposite his father. "Lords, give us leave," Henry says, the first line in the next scene but here cueing a blackout and intermission. The play's second half begins with this tableaux, Henry repeats the line, the chorus departs, and the father-son reckoning scene gets under way. Osborne and company are ever-aware of this particular play's place in the context of Shakespeare's second Henriad tetralogy: Richard II, the two parts of Henry IV, and Henry V. "It is in Henry IV, Part One, that we see the first glimpses of what Hal might be like as a ruler," Osborne writes in her program notes: "a king who can combine the stubborn pragmatism of his father, Henry, with the roguish charm learned from his second father, Falstaff. To ascend the throne, Hal has to renounce Falstaff and everything he represents. 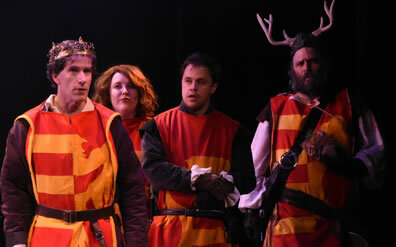 In this production, we've tried to indicate the cost to Hal and Falstaff of this renunciation, which ultimately allows Hal to transform into Henry V."
In red leather pants and jacket, the latter with cross-stitch patterns and a rope belt, Latham plays Hal with stand-up-comic casualness, taking a laissez-faire approach to his royal role and destiny. His “I know you all” soliloquy carries no more weight than the oblivious cockiness of a 20-something who's enjoying the party knowing he will succeed big time when called to his destiny. The first manifestation of that destiny comes at an unexpected moment: when he and Falstaff are in the tavern play-acting the upcoming meeting Hal is to have with his father. With Falstaff as Henry and Hal as himself, the Prince is all lark. When they switch roles and Hal starts playing his father, he begins to see Falstaff through the king’s eyes. The first half of his rant, insulting Falstaff about his age and heft, he plays for fun, leaving the tavern crowd, and Falstaff, too, in gut-busting laughter. By the time Hal gets to the end of this speech—"Wherein cunning, but in craft? Wherein crafty, but in villainy? Wherein villainous, but in all things? Wherein worthy, but in nothing? "—the prince has turned seriously introspective, Falstaff uncomfortable, and the tavern crowd quiet. In his subsequent scene with his father, Latham gives a confident smirk to Hal's retort that "I may, for some things true, wherein my youth hath faulty wand'red and irregular, find pardon on my true submission." Henry meets this with "Heaven pardon thee! "—dad certainly doesn't intend to pardon him—which surprises the son. Hal might not be certain how to respond to the political spin his father lays on him in this scene, but then Henry grabs him and spins him into the throne. Deliberately designed to be oversized, the throne makes Latham's Hal look like a child in a booster seat, toes barely scraping the stage. It's a pivotal moment for this production, leading to Hal's angry outburst that he has long intended to redeem himself on Hotspur's head. The scene attains a powerful climax, however, with Latham's reading of Hal's last lines: "If not, the end of life cancels all bonds; and I will die a hundred thousand deaths ere break the smallest parcel of this vow." Latham's tone is resignation. He'll fight to fulfill his destiny, but if he dies, all he has to lose is the debt he never promised. Hal is still playful with Falstaff in later scenes, but a telling moment comes when, after the royal party's parley with the rebel leaders, Falstaff tosses an apple to Hal, who, in perfect sync with his old friend, catches it with a giggle—then notices the king's watching him. Hal tosses the apple back to Falstaff and strolls off after his father. In a production set in medieval times, Costume Designer Maci Hosler has dressed Falstaff in a stained t-shirt, yellow-striped baggy pants, too-small brown vest, and boots that look like upside-down leather buckets. With a full beard edged in gray and a clown tuft of hair on an otherwise bald skull, Hall's Falstaff looks like something out of a poor man's production of Gilbert and Sullivan's The Mikado. When he goes to war, he dons a helmet with deer antlers sticking out (wink, wink). The ridiculous outfit belies a portrayal of Falstaff grounded in the character's superior intelligence. Hall's Falstaff sees Hal as his only equal in wit and enters their insult battles with relish. Falstaff's religious underpinnings also emerge in Hall's performance. The scoundrel famously references Scripture for his own purposes, but Hall's Falstaff also engages in one-on-one conversations with God—albeit, his God is just another confidante of his own kind. Hall doesn't dampen Falstaff's amorality; in fact, he intensifies it to a degree I've seldom seen. Upon coming upon the dead Blunt on the battlefield, this Falstaff steals the ring off the corpse's finger. He even turns our complicity in his behavior upon ourselves. Remember that he enters for war through the audience; he reveals in soliloquy how he traded conscriptions for "three hundred and odd pounds" of cash and then drafted "such a commodity of warm slaves" for his army, and the houselights come up on the audience. We are that army, being subjected to the astonished scrutiny of Hal when he enters the scene and says, "I did never see such pitiful rascals." I've seen this scene staged this way before (it's always effective), but Osborne stages a counterpoint to this moment a couple of scenes later as Murphy's Hotspur addresses his pep talk to us as his army. We are left to choose between Hotspur, who calls us "fellows, soldiers—friends" and encourages us to "live to tread on kings," and Falstaff, who calls us "food for powder" capable of "fill[ing] a pit as well as better." This Hotspur is having as much fun (and showing as much immaturity) as Hal is, but in the way of war and honor rather than drinking and bonhomie. "By heaven, methinks it were an easy leap, to pluck bright honor from the pale-faced moon, or dive into the bottom of the deep, where fathom-line could never touch the ground, and pluck up drowned honor by the locks," he says like a gung-ho quarterback in a cheer huddle or a gamer grabbing hold of his PlayStation controller. Like Hal, Hotspur shifts away from his father to a surrogage, except that in this production, his father and uncle, Northumberland and Worcester, have been regendered as his mother (Libby Mueller) and aunt. Murphy's Hotspur clearly has a more respectful, affectionate relationship with Lindsay's Worcester than with Northumberland. Both elders also give hints of their own destinies in their first appearances, Act I, Scene 3, when Worcester reveals the conspiracy to mother and son. In her zeal, Lindsay's Worcester sits on the throne (it's too large for her, too) to the admiring shock of Hotspur but the consternation of Mueller's Northumberland. At scene's end, Northumberland exits first and with a tone of disinterest, a foreboding of her later disassociation with the rebellion. 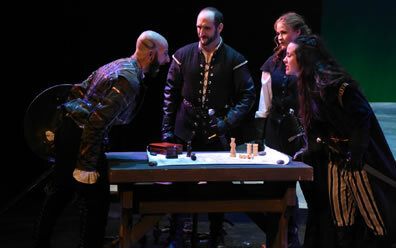 Top, Douglas (Alexis Baigue, left) wrangles with Vernon (Hilary Kelman, right) as Hotspur (Joshua Murphy) and Worcester (Megan Lindsay) watch during the rebels' council on the eve of battle in Southwest Shakespeare Company's production of William Shakespeare's Henry IV, Part One. Above, the king's party awaits a parley with the rebels: from left, Henry (Eric Schoen), Westmorland (Libby Mueller), Hal (Tony Latham), and Falstaff (Keath Hall). Photos by Laura Durant, Southwest Shakespeare Company. Regendering Worcester and Northumberland (plus Prince John and Westmorland), with pronoun and title changes, may not match the historical setting, but it in no way interferes with the play's plot, including the battle scenes. In fact, it allows for a meaningful double performance from Kelman, first as Lady Percy, and then as Vernon. The former has the heart of a warior. As Vernon, Kelman wears a determined bearing that matches the Douglas's while endowed with common sense: a woman's common sense. Hotspur and Douglas want to attack the king's forces immediately while "Aunt" Worcester and Vernon counsel patience. Says Vernon: "I wonder much, being men of such great leading as you are, that you foresee not what impediments drag back our expedition." Kelman displays great dexterity with Shakespeare's verse, as when her Vernon gives a stirring description of Hal mounting his horse and, later, issuing the single combat challenge with Hotspur. "Cousin, I think thou art enamourèd on his follies," Hotspur says, his tone suggesting, being as how Vernon is a woman, she has a secret crush on the prince. Kelman's Vernon, being a woman, replies with an eye-rolling expression that suggests, with much visual volume, what a typically stupid guy thing to say. Osborne and Fight Choreographer Randy Messersmith stage the Battle of Shrewsbury with fascinating theatricality. The Percy forces in black line up on one side of the stage opposite the King's forces in royal crest vests. The battle opens with a realistic volley of longbow strikes by the Percys (this is historical—a large portion of Henry's army was wiped out by such a barrage, a tactic Prince Hal witnessed and, as King Henry V, used at Agincourt). As the fighting continues, the sides begin to blend: We see a Percy fighting a Percy and a rebel fighting alongside Hal, all at varying speeds. The dead rise and walk unexpressively off the stage and return as new forces. Confusing? Yes, but such is the chaos of battle. People kill and die with volume. Douglas does in Blunt with three thrusts of three different blades, two from behind: a torturous death, the killer and killed both roaring at full lung power with each thrust, prompting an "eeewwwww" from someone in the audience. Then there's the emotional toll, represented by Worcester seeing the dead Hotspur and, emitting an anguished scream, cradling his body. The rest is denouement; well, not exactly. As Hal joins with his father and Princess Joan in victory, Falstaff down in front of the stage whistles to the prince. Just like old times. Latham's Hal glances at Falstaff then looks back to his real father. Old times are over. Strewn on the floor are four swords, one axe, one shield, one mace, one antler-topped helmet, and a half-eaten apple—the carnage of war. Is this any way to decide a nation's destiny, what Hotspur himself calls "the chance of war"? Or is destiny deciding itself? Of the four principals of this play, only one is not only capable but ready to wear the crown: Hal. We sense he will do so without his shoulders weighed down with care.